Barcelona set up a final-day La Liga title showdown with Atletico Madrid next Saturday after drawing with Elche. It keeps Barca three points behind Atletico going into that game at the Nou Camp, where victory would see Barca win the title on head-to-head record. 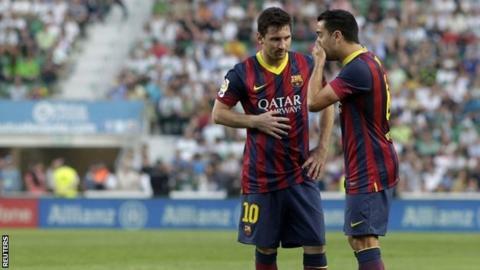 However, a Barca win over Elche would not have changed anything in terms of what was needed on the final day. The visitors had the best chances with Andres Iniesta hitting a fantastic volley which was saved by Manu. Alexis Sanchez, Pedro and Lionel Messi all had opportunities before Adriano curled just wide late on for Barcelona. Elche, whose point has secured their safety from relegation, failed to test Barcelona keeper Jose Manuel Pinto in the 90 minutes. Had Atletico beaten Malaga in their match which was being played at the same time, Diego Simeone's team would have won the title. However, that match finished 1-1. Last weekend, Barca's title hopes looked over after drawing 2-2 with Getafe to leave them three points off Atletico, with the club rumoured to be in talks with Luis Enrique about replacing head coach Gerardo Martino. However a lot can change in eight days and they are now favourites to win the league in Martino's first season in charge. Barca and Atletico drew 0-0 in their previous league meeting in January. Match ends, Elche 0, Barcelona 0. Second Half ends, Elche 0, Barcelona 0. Attempt saved. Xavi (Barcelona) left footed shot from outside the box is saved in the top left corner. Andrés Iniesta (Barcelona) wins a free kick in the attacking half. Foul by Carlos Sánchez (Elche). Substitution, Elche. Fidel replaces Coro. Corner, Barcelona. Conceded by Domingo Cisma. Attempt blocked. Dani Alves (Barcelona) left footed shot from outside the box is blocked. Assisted by Andrés Iniesta with a headed pass. Cristian Tello (Barcelona) wins a free kick on the left wing. Foul by Damián Suárez (Elche). Attempt blocked. Cristian Tello (Barcelona) right footed shot from the left side of the box is blocked. Assisted by Andrés Iniesta. Garry Mendes Rodrigues (Elche) wins a free kick on the left wing. Attempt missed. Adriano (Barcelona) right footed shot from outside the box is close, but misses to the right. Assisted by Cristian Tello. Richmond Boakye (Elche) wins a free kick in the defensive half. Substitution, Barcelona. Xavi replaces Francesc Fábregas. Foul by Marc Bartra (Barcelona). Alberto Rivera (Elche) wins a free kick in the defensive half. Attempt missed. Garry Mendes Rodrigues (Elche) left footed shot from the left side of the box is just a bit too high. Assisted by Richmond Boakye following a fast break. Substitution, Elche. Richmond Boakye replaces Carles Gil. Corner, Barcelona. Conceded by Lombán. Attempt blocked. Cristian Tello (Barcelona) right footed shot from outside the box is blocked. Corner, Barcelona. Conceded by Sergio Pelegrín. Attempt blocked. Francesc Fábregas (Barcelona) right footed shot from the right side of the box is blocked. Assisted by Alexis Sánchez. Substitution, Elche. Alberto Rivera replaces Javier Márquez. Hand ball by Domingo Cisma (Elche). Attempt missed. Andrés Iniesta (Barcelona) right footed shot from the centre of the box misses to the right. Assisted by Cristian Tello. Corner, Barcelona. Conceded by Damián Suárez. Pedro (Barcelona) wins a free kick in the attacking half. Foul by Rubén Pérez (Elche). Rubén Pérez (Elche) is shown the yellow card for a bad foul. Alexis Sánchez (Barcelona) wins a free kick in the defensive half. Offside, Barcelona. Dani Alves tries a through ball, but Lionel Messi is caught offside. Attempt blocked. Lionel Messi (Barcelona) header from the centre of the box is blocked. Assisted by Pedro with a cross. Pedro (Barcelona) is shown the yellow card for a bad foul. Manu Herrera (Elche) wins a free kick in the defensive half.